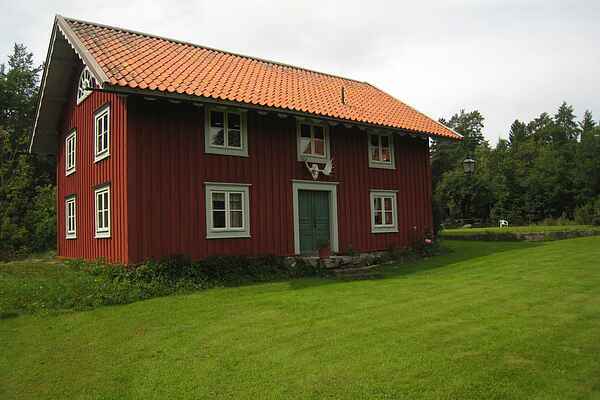 The location of this typical Swedish villa is beautiful: the beautiful lake Yxningen and in the woods. The villa is part of an estate dating back to the 16-th century. The house exudes a Swedish atmosphere with its classic design, wood and hunting elements and two saunas' s. Lake Yxningen located 300 m from the house. You can use the private jetty. Ideal to enjoy the nature, fishing, boating or swimming! The lake is large (31 km2) and is known for its beautiful varied landscape, the many islands and clean (drinking) water. A rowboat is on loan, a motorboat is optional . Much wildlife is there near that with a little luck you can admire at close: elk, deer, cranes and even eagles! Each season has its charm and you can, depending on the period, mushrooms, berries or wild strawberries. " In winter it is possible with a little luck skating, sledding or cross country skiing. On the farm pony 's, chickens and cats. For children it is possible to change the pony' s on the farm to care for and ride.